This multi-level parking garage is attached to the terminal building via skywalk on level three and walkway on level one. It offers an intelligent guidance system to assist drivers to open parking spaces using electronic signage and LED lights. 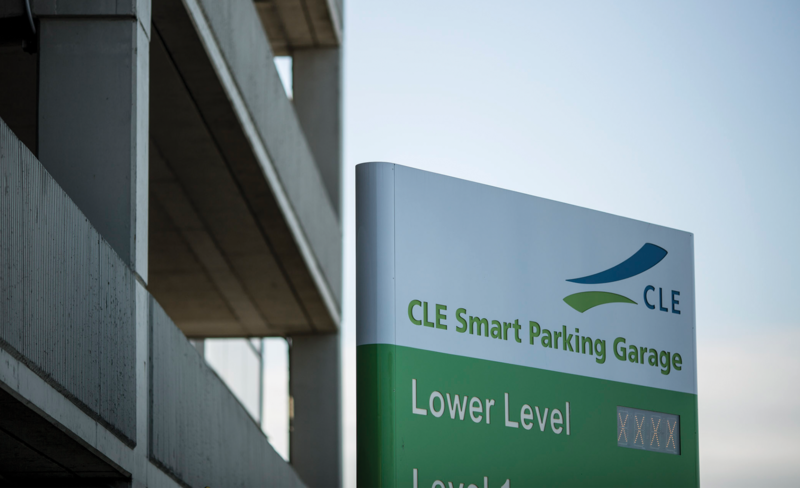 The CLE Smart Parking Garage accepts cash, personal checks and credit cards at a daily rate of $20.00 a day or $5.00 / hour for the first three hours. This surface lot is located on airport property directly north of the terminal. Enter by turning right onto Park Road from Inner Drive before you enter the arrivals deck – across from the Sheraton Hotel. The Red Lot is located on the left side of the CLE parking facility, across the street from the Blue Lot. The Red Lot is credit card only at a daily rate of $18.00. This surface lot is located on airport property just north of the terminal. Enter the Blue Lot by turning right onto Park Road from Inner Drive just before you enter the arrivals deck – across from the Sheraton Hotel. Turn right from Park Road into the Blue Lot. The Blue Lot is credit card only at a daily rate of $16.00. This surface lot is located across Park Road from the CLE Smart Parking Garage. Enter the Orange Lot by turning left onto Park Road from Inner Drive before you enter the baggage deck. The Orange lot is connected to the Smart Parking Garage via skywalk and offers direct, covered access from the lot to the terminal. The cost to park is $15.00 daily, payment is credit card only. The Brown Lot is located at 4960 Rocky River Drive, just north of the I-480 underpass at the intersection of Rocky River Drive and Brookpark Road. This 500 space lot features 6 bus shelters and provides shuttle service which will run every 15 minutes, dropping off/picking up passengers at Ground Transportation Center. Passengers will be able to pay with cash or credit card at a rate of $11.00 per day. $15 / 1 hr. to 3 hrs. $25 / 3 hrs. to 24 hrs. For those in a hurry or just seeking the ultimate convenience, CLE offers 24-Hour curbside valet parking, along with a range of concierge services. The service allows travelers to simply pull up, drop off, and then take off. Beginning 1/27/16, 24-Hour curbside valet parking will be located on the upper roadway by Door 1. Security officers patrol the CLE Smart Parking Garage 24 hours a day, 7 days a week. White courtesy telephones are located in the elevator lobby of Floors 2-5 of the CLE Smart Parking Garage. To obtain emergency vehicle assistance (provided by Standard Parking), dial 4770 on any white courtesy telephone, or call 216.267.5030. Smarte Cartes are located in the elevator lobby on Levels 1 and 3 of the CLE Smart Parking Garage. Smarte Cartes are $5 (price subject to change).